The Chain Link Card Lock® System contains three components and is designed to achieve controlled access of fence enclosed areas. The components are assembled at the site, in order to accommodate right or left openings; in, out, or bidirectional swinging gates. The system includes a weather proof Card Lock® housing, electric strike housing with strike, and a door knob housing with heavy duty door knob set. This system is designed to be welded or otherwise affixed to a gate and chain-link fence. The system operates on 16 volts AC or a 6 volt dry-cell battery. The Chain Link Electric Lock contains two components and is designed to achieve electric or manual controlled access to fence enclosed areas. The unit will accommodate right or left openings; in, out, or bi-directional swinging gates. 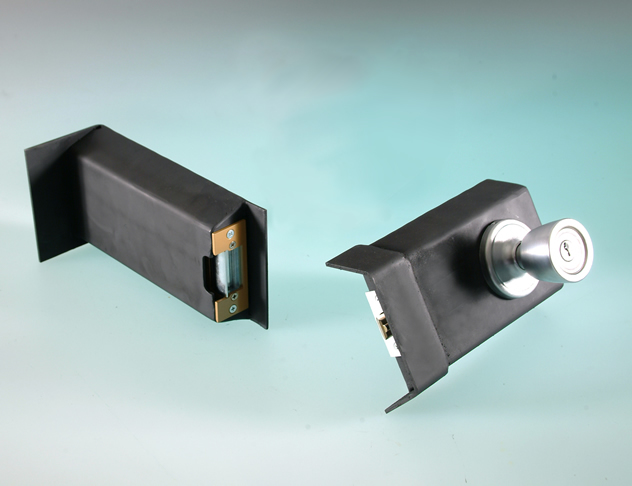 The system includes a strike housing with an electric strike and a door knob housing with a heavy duty door knob set. The system is designed to be welded or otherwise affixed to a pedestrian gate and chain-link fence. A flat surface on the strike housing allows for mounting of a push-button lock or Card Reader. The flat surface is 3 1/2″ x 5″. Strike voltage 3-6 VDC/8-16 VAC; 12 VDC/12 VAC Int. or Cont. ; 24 VDC/24 VAC Int. or Cont. ; Strike Function: Non-Fail safe. Size assembled: 16″ x 4″ x 1 1/2″; Weight: 10.5 pounds; Finish: Black Primer, 24 months limited warranty. Card activated electronic vehicle gate opener. This system can also be modified for use on electronically operated pedestrian security gates.